Mission almost accomplished! 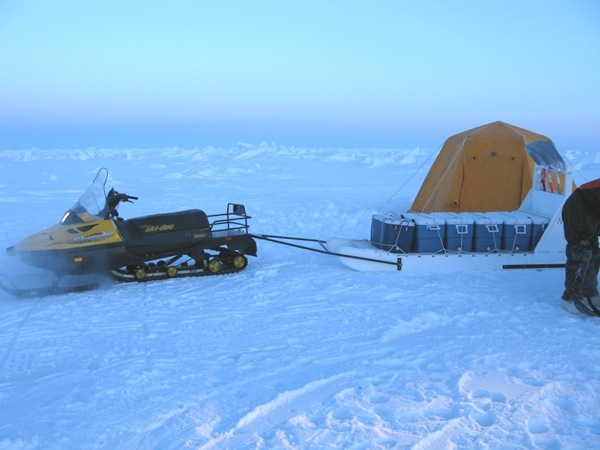 We made it back out to our ice camp today to collect our third and final set of samples for this trip. I once again dared to ride the sled (and yes with Zac driving) because I wanted to take some video of the trip out there. However, this time I rigged up a harness to wear that made staying on much easier. It worked and I was even able to comfortably hang on to the slide one-handed while I filmed the trip. I’ll try to post some of that video on YouTube soon. The weather was much warmer today, and we even got a little hot in the ice tents with the propane heaters running. Now that we’re almost done, we’ve really got the routine perfected and everything went smoothly. In our explorations we came across a natural structure formed by colliding ice pressure ridges called an ice house which was really fantastic. Marc in the "ice house"
I was sure that a human had built it, but Reynold assured us that it was natural. Of course both Zac and I had to go into the house and have our pictures taken. We also climbed up a few small ridges which afforded some really nice views of the camp and its surrounds. Zac talked Reynold into letting him pose with his shotgun. I learned later that the gun was actually not loaded while Zac had it. The procedure is that only if a bear is actually spotted is the guard allowed to load the gun. I sure hope a bear doesn’t surprise him. Sounded a little bit like Barney Fife to me. Remember, Sherriff Andy Griffith would only let him have one bullet and he had to keep it in his pocket? After collecting all our samples and tying them back down on the sleds it was back to the lab for another day of filtering water. Again my harness worked well, and I didn’t even come close to falling off. Zac drove especially carefully as well. Everything went well in the lab, but this time we had a little trouble with our filtration rigs freezing. We finally got the cold room to our target temperature of -1.8°C (28.8°F) which was great except that every time it warmed up a little bit the compressor and blowers would kick back on and bring it down to -2 or -3. This was just enough to cause some freezing in our equipment. Frozen water doesn’t filter very well it turns out. So we combated freezing problems until we were freezing ourselves and the job was finally done. After putting the samples away and cleaning-up a little bit we headed to the girls cabin (hut) for some homemade chicken soup that Lollie had made. It was delicious and nothing beats a bowl of hot chicken soup when you are cold to the bone and all you’ve eaten is a package of instant oatmeal 9 hours earlier. Still hungry though after the soup we headed into town to our favorite restaurant in Barrow (Arctic Pizza) for the second course. Today was our second scheduled sampling day. We started off the day with the most amazing start of the twilight time ever. Dawn! Around 10:30 am Barrow time. I managed to take a picture but it doesn’t begin to do it justice. The temperature has actually warmed up quite a bit, which means it can snow, and it did. 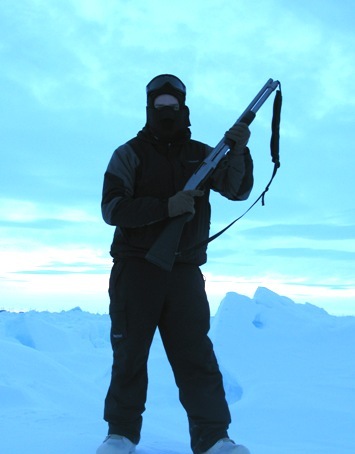 But that didn’t stop from heading out to our ice camp and sampling. This time I decided that I’d better drive my own snow machine. I tried to get Zac to take the sled musher position, but he declined. Actually, he was going to ride the sled (I think he was going to fake falling off to even the score), but he was drafted to drive Tish Yager (our lead PI on this project.) Does anyone else think this wasn’t the best idea? But Tish was smarter than I was and opted to ride on the back of the snow machine instead of the sled. Even so, having heard the story of the previous day’s adventures, she held on so tightly that if she fell so would Zac. They arrived at the camp intact. Today, on their own initiative our fantastic support team had actually gone out to the camp early to set things up, so by the time we got there the propane heaters were running and the tents were already warmed. This really made our jobs a lot easier. The YSI instrument even seemed to behave itself today. I’m still not confident in our results, but at least they were in the right range today. The good news is that the salinity gradient we thought we observed and that worried us appears to have been an artifact of the misbehaving instrument. We finished sample collection in record time, just under two hours and headed back. Zac and I spent the rest of the day filtering water in the temperature controlled room. Under normal conditions I would call this room a cold room since we have set the temperature to match the ocean temperature which is -1.8°C (~29°F), but compared to outside air temperatures it is a warm room. Outside temperatures today were about -20°F and the wind made it feel like -40. Strange to go into a freezing room to warm up, but that is what we did today. Everything went smoothly filtering water and we were done by dinner time. Having missed lunch again and spent the whole day at below freezing temperatures, dinner was again large and satisfying. Today at the cafeteria they had salmon. Tomorrow will be another lab day. No weekends for us I’m afraid. 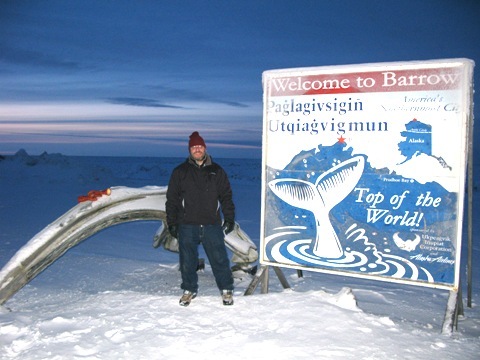 Dr. Marc Frischer continues his blog postings on his current research expedition to Barrow, Alaska. Day 6 into our trip, just past the mid-point. After spending most of the day in the lab, the first set of RNA samples have been processed and are awaiting shipment back to Skidaway. One of the primary goals of our work is to understand the underlying mechanisms that allow bacteria to adapt and respond to a changing environment, particularly to changes in the nutrients available to them. To do this one of the things we’re looking at is the genetic expression of important genes involved in nutrient assimilation. To get at those questions we need to look at their messenger RNA (mRNA), but because mRNA is typically very unstable, this is not an easy task. To put some perspective on the problem, a typical mRNA molecule, if left alone, will degrade in seconds. Much of the challenge for us during these studies is to get the bacterial mRNA stabilized so that we can analyze it. Basically, that is what we were doing in the lab today, extracting, purifying, and stabilizing the mRNA from the bacteria we collected on our filters. Besides working in the lab and getting ready for another sampling trip on the ice tomorrow, we did manage to enjoy the relatively relaxed day. First off, I started by oversleeping, something I haven’t been able to do for it seems months. Even though I missed breakfast, I think the sleep did me a lot more good than breakfast would have. Finally, I seem to be kicking the cold I’ve been struggling with for the past couple of weeks. Later in the day we enjoyed another beautiful sunrise. The sun rose today at 12:27pm, 43 minutes earlier than on January 24th when the sun first rose. The sun was visible for 1hr and 8 minutes today. What’s really remarkable is how much it changes from day to day this time of year. On the day we leave next week the sun will rise at 11:23 am. This evening we were invited to a dinner hosted by Peggy Cowan. Peggy is the superintendent of the North Slope Borough School District Board of Education and a friend of Savannah’s Joyce Murlless. Peggy started her career in Savannah as a teacher at Oatland Island Wildlife Center. Joyce made the introduction for me and we jumped at the opportunity. 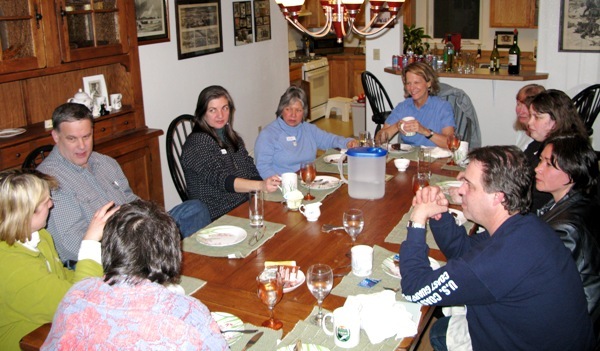 Peggy invited several local science teachers, other educators and planners, and Deb, Tish and myself for dinner at her home. We had an absolutely lovely evening eating pizza and getting to know each other. We’re hoping that this will lead to some long term collaborations whereby we can contribute back to the local community. Thanks for the hook-up Joyce! 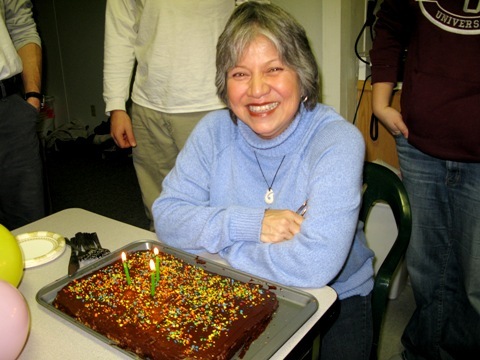 Upon returning we celebrated Lollie’s 61st birthday. The rest of the team had baked a cake and decorated the hut. Lollie blew out the candles. Happy Birthday Lollie! Dr. Marc Frischer continues his account of his research expedition to the north coast of Alaska. Today was the day. The weather was relatively mild (only -25 deg F); the crack seems stable; and everyone was ready to go. So, after a brief lesson in snow machine operations, we were off. 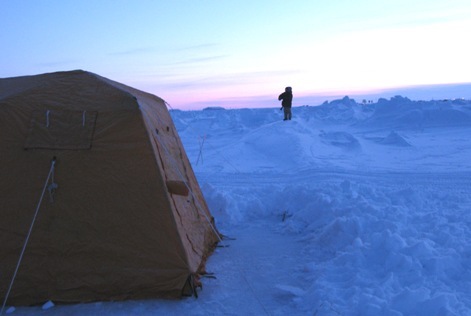 Because of the ice conditions we had to locate our camp a bit closer to shore and in shallower waters than we would have liked. We prefer to be in deeper water to be assured that we are sampling coastal ocean water. We would like to be about another half or ¾ mile offshore. However, being closer to shore does has some advantages. The camp is only about 2/3 miles away from our labs (as the crow flies) and 1.3 trail miles. This means that even going slow it only took us about 15 min to get to the camp. and then let us get to work. We quickly assessed the conditions to make some decisions about sampling. 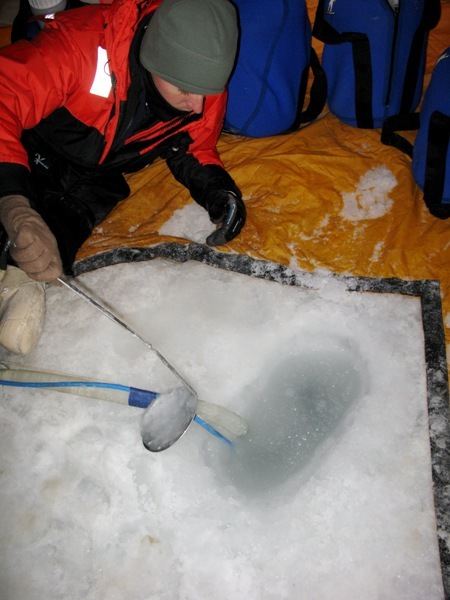 The ice is about 0.9 meters (2.95 ft) and the depth was approximately 10 meters (33 ft). For geographic geeks, the camp is located at 71° 17’ 30’’N 156° 45’ 55’’W. I also attempted to measure some basic water quality parameters to get a sense of the structure of the water column, but alas, the instrument we were using didn’t seem to have liked being frozen during the trip out to the camp. However, even if we can’t trust the numbers, they did suggest that the water was less salty then expected and that there was a salinity gradient from the surface to the bottom. We were hoping this wouldn’t be the case, but it was one of our concerns being so close to shore. We’ll see how this affects our results. Regardless, it will be interesting and we will learn something new about the microbes in the Arctic coastal ocean during the winter. Sampling couldn’t have gone more smoothly. Everyone worked together, the equipment performed well with the possible exception of our temperature, salinity, and dissolved oxygen instrument. All our preparation paid off in spades. After about 2 hours we were ready to return to the labs to start processing the water that we had collected. So with the sleds loaded up and all of us just a bit colder, we headed back. This time the sleds were much heavier so it was a bit more treacherous. Zac managed to toss me off the back of the sled when he hit a particularly rough spot. That in itself wouldn’t have been so bad (no damage done), but he didn’t notice that I had fallen off and he continued. Luckily we weren’t the last ones in the convoy, and Alice Drake was kind enough to pick me up and run me back to my sled which had finally stopped when Zac eventually realized I wasn’t there. Advice to graduate students, it is not very smart to dump your advisor on the ice and take off! After dinner, a huge pasta and chicken parmigiana meal at the cafeteria which really hit the spot, we spent the rest of the evening cleaning-up and documenting our days work. Tomorrow will be a day in the lab where we’ll purify RNA from some of our samples and get everything ready for the next sampling event. Hopefully on Friday. We’re getting there! With our team mostly in place (Debbie Bronk and Karrie Sines arrived today), we’re now only missing our fearless leader Tish Yager. Tish, due to family obligations, couldn’t arrive until Thursday. Today, after a brief meeting with our logistical support team, it was decided that we would set-up our ice camp in the early afternoon. 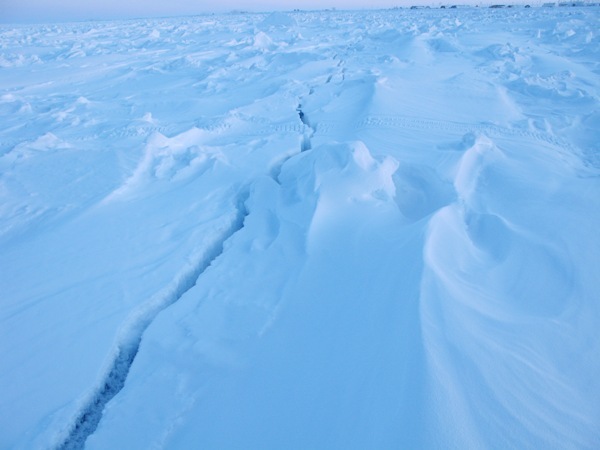 The crack in the ice is still a concern because it indicates that the ice is still moving, but the experts think that the risk of the fast ice breaking-up is small. We’re watching it carefully, but moving forward with our plans. The logistics team took care of most of the work setting up camp, but Zac and Tara went along to lend a hand and to advise the team on the specific location of the tents, the ice holes, and the placement of the heaters and generators. 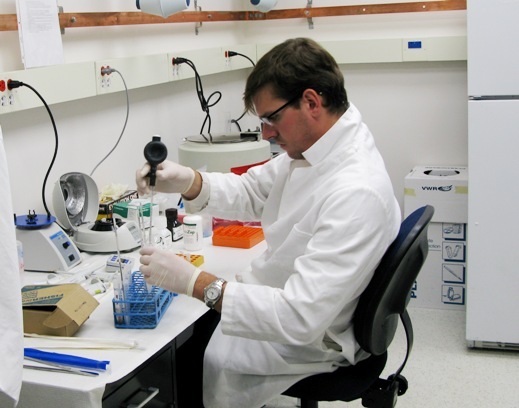 It is important that any potential contamination of our samples is minimized and so that our sampling can be conducted as efficiently as possible. 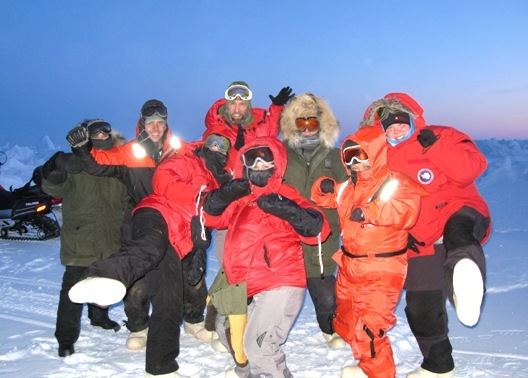 The trip went smoothly, our camp was established, and I heard that the camaraderie was good. Tony’s joke; told while drilling an ice hole. Put some frozen peas around an ice hole, wait for a bear to come take a pea and kick him in the ice hole. Say it out loud and you’ll get it. I know…., you had to be there, but Zac took videos. 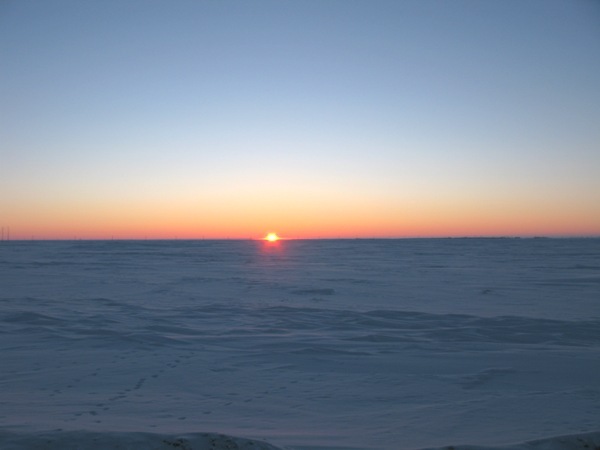 Sunset from our ice camp. Imagine the situation, out on the ice in the extreme cold and surrounded by the beauty of an Arctic winter day, its enough to drive anyone a little cold crazy. After several hours on the ice, Zac is cold crazy. Meanwhile, the rest of us remained on the station setting-up our labs and making sure that we would be ready for tomorrow’s planned first sampling. Not so exciting, but it really is satisfying to finally see the results of the months of planning realized. And we’re even more excited to generate the results from our winter experiments. We are guessing that we’ll see major differences in microbial activities and communities in the winter compared to the spring and summer. We are especially eager to observe how the bacteria are using various forms of nitrogen. Nitrogen is a limiting nutrient for phytoplankton and phytoplankton form the base of the food web that ultimately feed all the larger organisms including whales and humans. 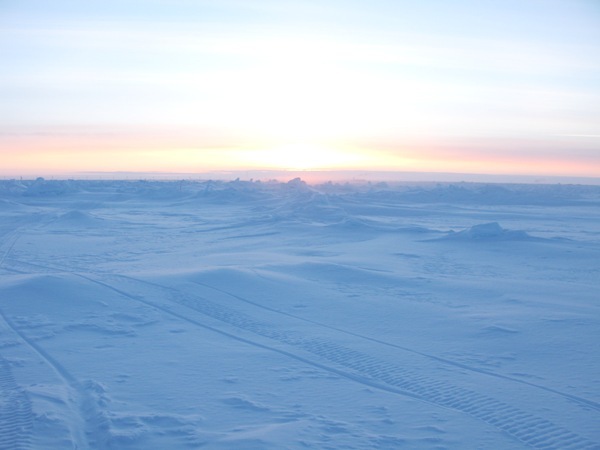 One of the central hypotheses of our project is that if the permafrost melts and releases large amounts of nitrogen-poor humic materials that are stored there, this will increase the use of dissolved inorganic nitrogen by bacteria. If this occurs, potentially there will be less nitrogen available for the phytoplankton in the spring when the lights come back on and consequently less food for all the larger organisms. Our experiments this week should tell us whether the logic of this idea is correct. 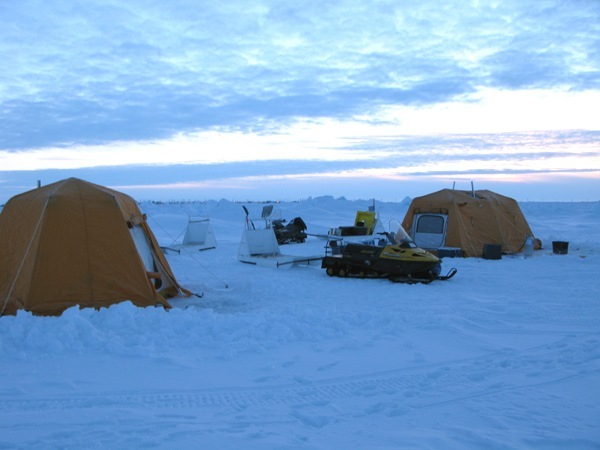 With the ice camp established and our labs set-up, we’re ready to start collecting samples tomorrow. Wish us luck! 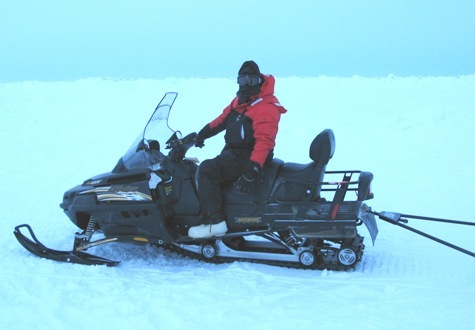 Marc Frischer continues his account of the challenges of conducting research during the winter on the north coast of Alaska. 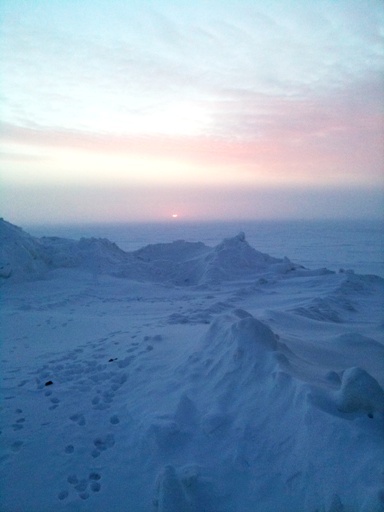 Another balmy day in Barrow, as I’m writing it is currently 46 below. Our day started with a meeting of the full logistical support team. 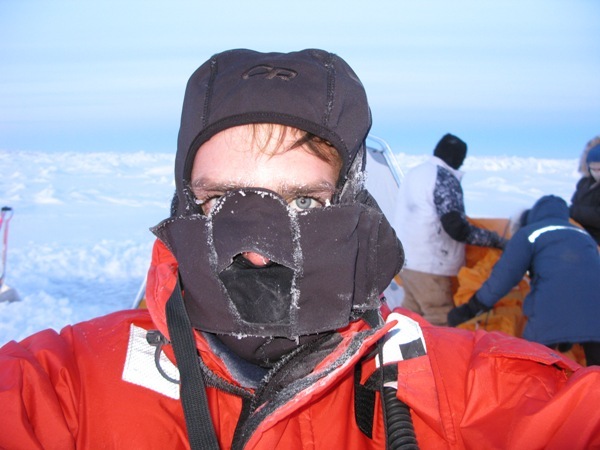 The main issue of discussion was how cold it was and whether it was too cold to go out on the ice. We had entertained thoughts of setting up our ice camp (2 tents, 3 holes in the ice, generators and propane heaters) today, but by 11:00 when it was still 40 below and after much discussion, our lead ice expert and native elder Charlie Hopson declared it unsafe. Truly I was relieved. Besides, the weather forecast is predicting warming through the week and since most of our team hasn’t arrived yet and our first actual sampling trip isn’t until Wednesday, I decided that we have the luxury of waiting a bit more. Anyway, Zac and I still have plenty of setting-up to accomplish. So, instead of a trip on the ice, we spent most of the day continuing to unpack, setting-up our three work areas, and replacing the wiring on our submersible sampling system with Artic grade electrical wire. Turns out that regular wire easily breaks at temperatures as cold as we’re experiencing. Later in the afternoon a few of the logistics support team took a ride out to the site to break trail, level the surface where we’ll set up the tents , and to make sure that the site was still suitable for occupation. 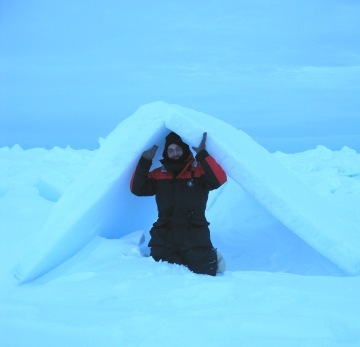 The trip went smoothly except that they discovered a crack developing in the sea ice close to shore. If the ice was to dislodge from the shore there is a chance that our camp (and us with it) could go floating away into the Arctic Ocean. Needless to say, we are monitoring this crack very carefully. We shouldn’t forget that just because it is covered in ice, underneath the coastal Arctic ocean is still churning and can be a very treacherous place with strong and often changing water currents. Meanwhile, Lollie and I took a little trip of our own onto the ice covered tundra to get a clear photograph of the sun’s brief appearance. The sun was noticeably higher on the horizon today compared to yesterday. Later in the evening the next contingent of our research team arrived. From Tish Yager’s group Tara Connelly and from the Bronk group Quinn Roberts, Rachel Sipler, and Steven Baer. Now we’re only missing three. After getting them settled in we called it quits for the day retreating to our rooms to catch-up on other work and getting ready for tomorrow. Or at least that was what I was going to do until the water went out in the building that the women are staying in. Since water is delivered by truck to that building and there was nothing to be done until the morning, we quickly gathered some buckets of water from the lab so that they could at least flush the toilet a couple of times during the night. No showers I’m afraid. Tomorrow morning we’ll meet again with our support team. Hopefully we’ll be able to set-up our camp. 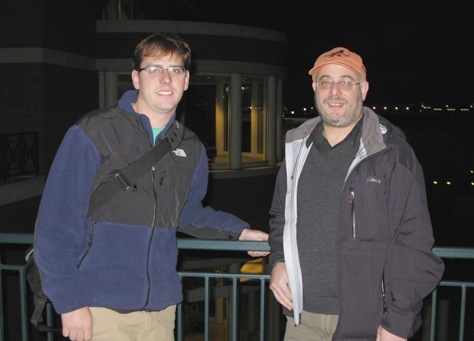 Skidaway Institute professor Marc Frischer is back in Barrow, Alaska, along with grad student Zac Tait, to conduct field work on his project into the effects of warming climate on the marine food web in the Arctic Ocean. As he did with a prior trip last summer, Dr. Frischer will send updates on his “adventure.” To review his earlier trip, the first of his series of posts can be found here. 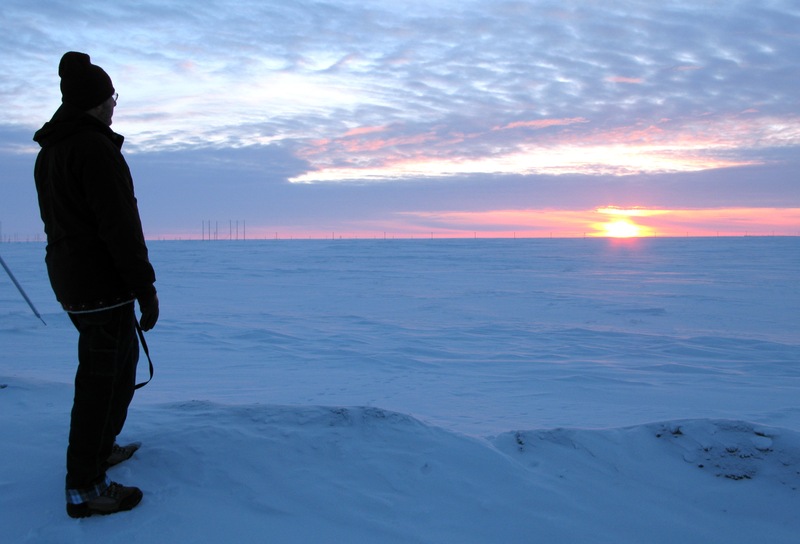 Hi all, we’re heading back to Alaska to complete another sampling expedition of the high Arctic. If you recall, our last trip was during the summer time when temperatures were mostly above freezing and the ocean was liquid (if you missed our previous trip you can catch up from our previous blogs). Things are a little different up there now. Read on! We began planning for this trip almost as soon as we got back from the last. The minute details, especially getting necessary chemicals and other supplies in place require an amazing amount of organization. But we mostly managed (thanks largely to Victoria Baylor’s hard work). The goal is to never get ahead of your equipment and supplies. With our gear shipped off, the day for our departure finally arrived. This time Zachary Tait and myself are making the trip. Zac is a graduate student from Savannah State University who has been making this project the focus of his MS thesis research. Unfortunately, both Zac and myself are still getting over bad colds so we didn’t feel quite 100%, but we persevered. Leaving Savannah in the early morning we flew first to Atlanta (as usual), on to Minneapolis, and then to Anchorage. We arrived in Anchorage at 6:00 pm local time (10:00 pm Savannah time) for a total of 14 hours of travel. 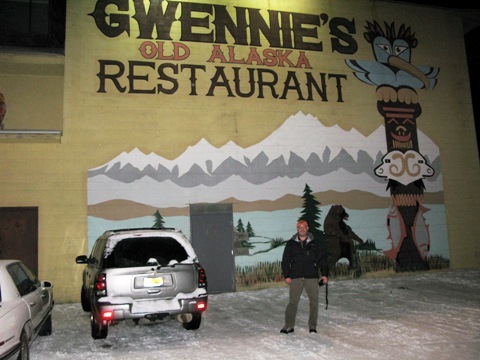 Weary, we checked into our hotel in Anchorage and headed out for a quick bite to eat at a nearby local restaurant; “Gwennie’s”. It was surprisingly good. 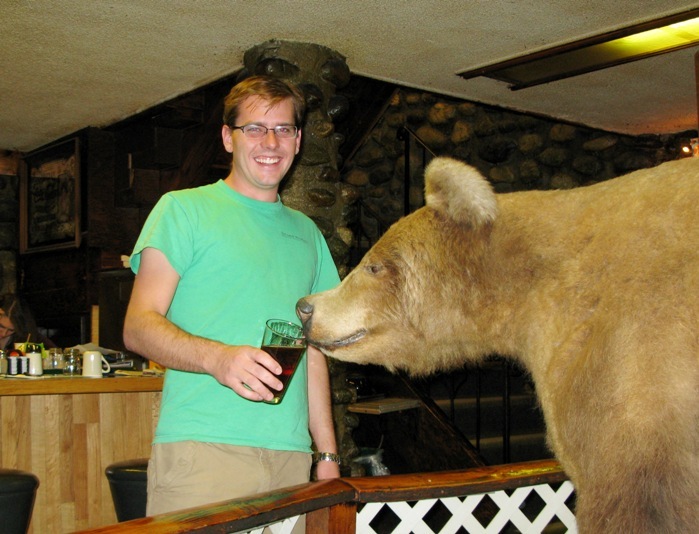 Both of us ordered the chicken fried steak and a locally brewed beer which Zac felt obligated to share with the restaurant’s mascot Brown Bear. After a satisfying dinner, neither of us had a hard time sleeping and we got as much of it as we could before having to wake at 3:30 am to catch our next flight. Leaving Anchorage we flew first to Fairbanks, on to Prudhoe Bay, and finally into Barrow. 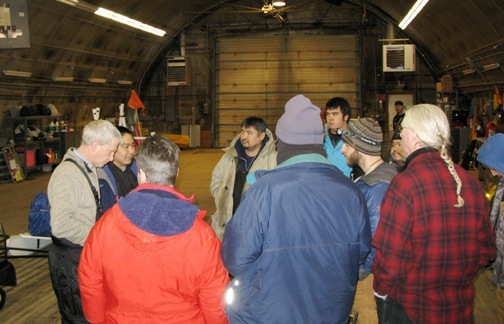 In Barrow we were immediately shocked by the weather, stepping off the plane it was -42°F with a windchill of -67°F. Even the natives think this is cold. 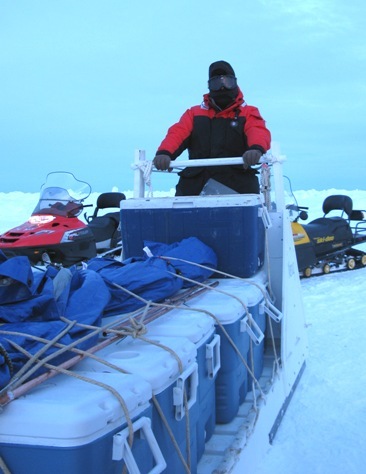 Once we collected our bags (everything made it) we hopped in the truck and headed to the Northern Arctic Research Laboratory (NARL) campus. Since our last trip our logistical support team switched to a different group. Many of the people and procedures are the same, but there are several new faces (to us) and some of the facilities are different. We’re optimistic that this will work out well (So far it has.). Once we had a briefing and were introduced to the new folks, we quickly got to work rounding up all our gear and setting up. We made a lot of progress but we didn’t get it finished. For one, the temperature controlled environmental chamber that we will work in to filter all the water we collect wasn’t ready for us. Apparently it had been used since our last visit to process whale meat. We didn’t actually look at it, but we were told that they had to remove the floor (too much blood soaked into it), grind the scum off the walls, and finally sterilize the whole room with bleach. Glad I didn’t have to do that job! Hopefully, the room will still be suitable for our use and it will be available tomorrow. But back to the day. 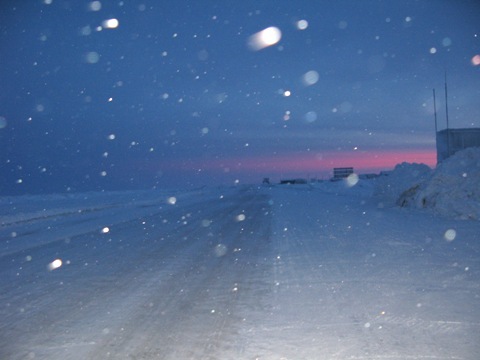 Today, it turns out, was the first sunrise in Barrow since November. The sun rose at 12:38 local time and set at 2:46pm. 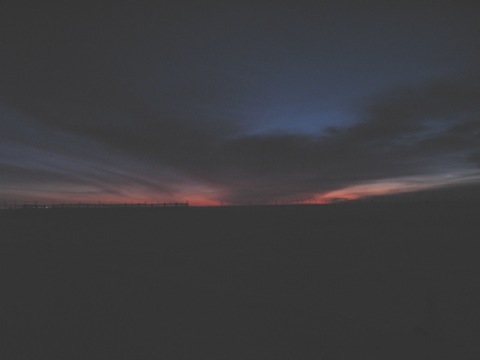 But it wasn’t at all dark for much of the surrounding hours because of the twilight time. I was surprised at how bright the extended twilight period was. Today twilight extended from 10:27 am to 4:54 pm. This actually gives us quite a lot of light to work in. But today was the first time the sun rose above the horizon. Cool huh? I had thought the locals would have celebrated at bit, but apparently not. I asked Tony Kaleak, a native about it and he told me, sometimes, if they notice, they look at the sun for a moment and say “Right On”. Anyway, we thought it was pretty spectacular. By 5 pm we were pretty beat and decided to call it a day, spending the rest of the evening discussing details with the logistics staff and picking up a new member of our team, Lollie Garay from the airport. Lollie is a science teacher being sponsored by the Polar Trek program to accompany us and develop collaborative relationships with local educators. Its pretty exciting stuff. Lollie is also going to blog about her experience and as soon as I get her blog address I’ll pass it on. But now its time for me to get a little shut eye. Tomorrow will be another busy day preparing. 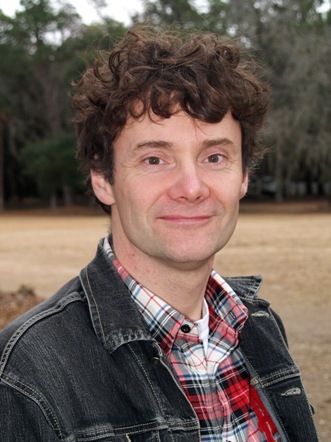 Two new scientists have joined Skidaway Institute of Oceanography from Bergen Norway. Marine plankton biologist Jens Christian Nejstgaard joins the faculty as an associate professor. Nejstgaard received his bachelor’s degree in biology form Gothenburg University, Sweden and his masters and doctorate in marine biology from the University of Bergen. Since then he has held several research positions in Bergen, and now leaves a position as senior research scientist at the research foundation UNI Research as well as a position at University of Bergen as the director and coordinator of the European Union project MESOAQUA. Aquatic ecologist Stella Angela Berger joins the Skidaway Institute staff as a research coordinator. 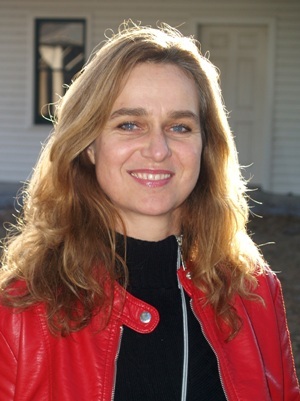 Berger earned her doctorate in limnology from Ludwig-Maximilians-University in Munich, Germany. Most recently, Berger worked as a researcher in mesocosm studies within MESOAQUA, at the University of Bergen, Norway (http://mesoaqua.eu).